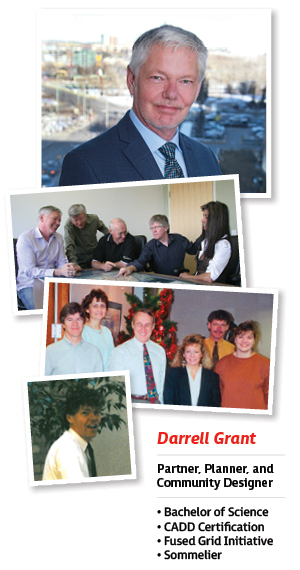 Following almost 30 years of dedicated work at B&A, Darrell Grant is set to officially retire in April, 2018. Darrell has been an incredible asset and has brought many years of inspiration and hard work to the team with several unique and leading-edge projects under his belt. Thank you for your commitment and enthusiasm Darrell – we wish you well. Past April, Darrell will continue to work with B&A in a consultant capacity, and provide ongoing project support for an additional year. We look forward to using this transition as a chance to continue to learn from Darrell as he passes on industry knowledge, best practices and project tools to our team. Norman “Darrell” Grant was born in High River, Alberta, and spent the first few years of life on a farm north of Blackie before he and his family moved north to the Edmonton area. Darrell enjoyed his childhood in Devon where the North Saskatchewan River valley provided him with opportunities to explore, build tree forts and go tobogganing. Eventually, Darrell moved back south to attend the University of Calgary where he began to study for a career in urban planning. Before graduating, he was hired part-time at B&A, and following a brief hiatus and an economic slump in the late 70s and early 80s, Darrell began to work full time at B&A. It was in the early 80s when Darrell met his life partner, Dominique, an ex-pat from France, and started a family. Darrell’s passion is to give loving guidance to the growth of his two grandchildren, Neo (aged 3), and Ophelia (aged 2). Family is very important to Darrell and he is deeply grateful for the regular dinner gatherings and special celebrations with loved ones. Genealogy is also one of Darrell’s favourite pastimes and he is often found on the computer trying to find the proverbial last ancestor of his lineage. Q: What university/universities did you go to, and what did you graduate with? A: University of Calgary (1974-1978), with a major in Geography and a minor in Urban Studies. Q: How long have you been a planner and where did you begin your career? A: I have been a planner for over 30 years, and have worked at B&A for most of that time. I started working before graduating from U of C which included summer stints at the Battle River Regional Planning Commission. Q: Why did you become a planner? A: I have always had a passion for design. In Grade 2, I built a small model town for Social Studies and in Junior High I created an imaginary town plan. I also found out in later years that two of my ancestors were town founders: one in Virginia in the 1700s (Christiansburg) and one in southern Alberta in the early 1900s (Rowlandville). I guess it is in my blood. Q: If you didn’t become a planner, what career path do you think you would have taken? A: Either a chef, because I love to eat; a sommelier because I love to drink wine; or an architect because of my love for design. Q: What have you enjoyed most about your career? A: The variety of work has given me the opportunity to stay current and experience different challenges. Q: What are some of your most memorable projects at B&A? A: The CFB Calgary trilogy of Garrison Woods, Garrison Green, and Currie Barracks. These are all leading-edge planning projects with award-winning results. Q: What have you enjoyed most about working at B&A? A: The variety of work – no two days have been the same throughout my career. Q: What is one of your favourite memories at B&A? A: I have had an excellent mentor in the name of Greg Brown who allowed me an immense amount of latitude. Development tours were also a nice break from the daily office routine. Q: What is something you know now that you wish you knew when you were starting out your career as a planner? A: I’m not political and can get disenchanted when politics enters the planning arena. Q: How do you hope to spend your time while retired? A: Building a family compound for four generations on four acres near Okotoks and having more me-time with my two most favourite munchkins, Neo and Ophelia. Travelling with Dominique is always a fun diversion too. A: Work hard to reap the benefits while enjoying life one day at a time.